Sharman Apt Russell is a contributor to Writers on the Range, the opinion service of High Country News. She is a writer in New Mexico. On Sept. 27, 1956, my father piloted the tricky, experimental X-2 on one of its first flights of well over 1,000 miles per hour. That day, the rocket plane performed exceptionally well and set a new speed record. Then it spun wildly out of control. I was only 2 years old when Captain Milburn Apt crashed and died in the Mojave Desert at Edwards Air Force Base, California. I have always admired my father’s courage and service to this country, as I admire the courage and service of so many American pilots. Yet I do not admire what the Air Force plans to do where I live. In 2018, Holloman Air Force Base in New Mexico will decide whether to create a new Military Operations Area for F-16 fighter jets above the Gila River watershed in Grant County, New Mexico. There would be potentially 10,000 “sorties” a year, with a sortie defined as a plane leaving and returning to the Air Force base. Ten percent of those flights will be Mach 1, faster than the speed of sound at 768 mph, and 10 percent will take place at night. Many of the fighter jets will be flying at high speed just 500 feet above the ground. Others will be dropping flares and a radar-deflecting metal material called chaff from above 2,000 feet. These maneuvers, designed to test new pilots, will take place over the Gila National Forest and Gila and Aldo Leopold wilderness areas, skirting the vibrant arts-and-culture town of Silver City. How did local people react to these plans? They weren’t asked. A 30-day “scoping process” to inform the Environmental Impact Statement required by this plan took place this last fall. To help assess the environmental and social impacts of the flights, the Air Force held three town meetings, but not one was in the affected area of Grant County, New Mexico, a population of 30,000. 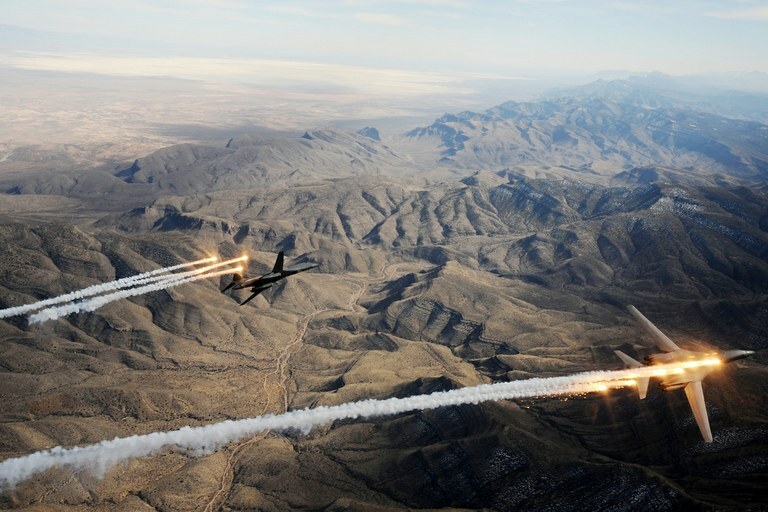 A two-ship of B-1B Lancers release chaff and flares while maneuvering over New Mexico during a training mission. Not a single voice from the farmers and ranchers of Grant County was heard. Nor from Silver City, a community that largely depends on tourism, recreation and retirement. And not a single voice was heard from the many people who value the heritage of this country’s oldest wilderness and the peaceful beauty of New Mexico’s last free-flowing river. The Air Force made no serious attempt to inform the citizens of Grant County about the new Military Operations Area. At a special county commission meeting that was organized after the military’s scoping process had closed, Air Force representatives said that they had sent a letter to one county commissioner and another letter to a regional newspaper that was not the newspaper of record. The Air Force apologized for any misunderstanding and agreed to allow further public comment up to the completion of their draft EIS this spring. More public hearings will then follow. Those comments can be submitted online or mailed to an address on that website. Among two options, Alternative Two creates a new testing area. Here in Grant County, we have the next few months to help shape that draft environmental impact statement. Some of us will explain how bursts of extreme noise — sonic booms — many times an hour will affect our health and well-being, as well as our sleeping patterns. Others will talk about the effect of sporadic booms on deer and other wildlife, horses, hikers, hunters, children and the elderly and sick, as well as property values. We can point to the values of silence and solitude that are embedded in the Wilderness Act itself. We can explore the potential hazards of falling chaff to wildlife and people. My friends and neighbors in the Gila Valley are not anti-military. But the way the Air Force initially pushed this plan through without consulting those most affected by it was flat wrong. The scale of training being proposed for this new Military Operations Area is extreme. Holloman Air Force Base has other options, including dividing these 10,000 flights among multiple training areas and the nearby White Sands Missile Range. Preserving the unique character of rural New Mexico is more than a self-interested, not-in-my-backyard stance. Our national forests and wilderness areas deserve protection because they are legacies that belong to everyone.